Thread Algae grows on leaf edges as a single, up to 30cm long, thread. It is easily removed by twirling a tooth-brush around it. Excess iron is a possible reason. It is good to use ground iron fertilisers since this algae uptakes the iron from the water. Healthy plants will out-compete this algae. 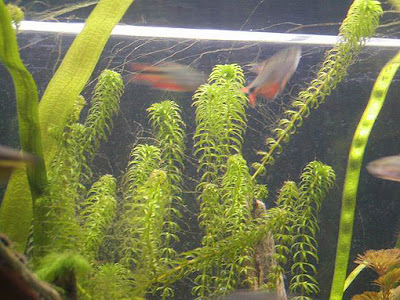 It is known that algae eaters like SAE and Caridina japonica will consume it, as well as Barbs. Thread algae is very likely to appear together with the Hair algae. My SAEs, American Flag-fish, Neritina Zebra snails, Red Cherry shrimps, Otos don't show any interest in eating this sort of algae.